This is the third of five green tips where we look at ways to transform “useless” junk mail into stylish and free gift wrap. 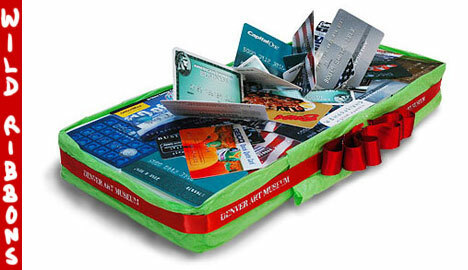 Will you ever see unwanted plastic credit cards in quite the same way again? With a little creativity, almost any piece of junk mail can be transformed into a wild ribbon that will add drama and panache to your packages. John Boak is the master wrap artist behind the crazy-credit-card-and-junk-mail gift wrap package above. But whether you want to make a bold statement like his above, or just add a little 3D magic to your junk-mail gift wrapping, it’s easy to do. In this tip we’re going to look at making a fan shaped paper ribbon and a curled ribbon. The fan-shape ribbon, featured above, was created in less than thirty seconds. You may even remember making one of these as a kid?! Just take an 8×10-inch sheet of junk mail and start folding it horizontally or vertically into a strip. (No tearing or cutting is required.) Once you have your sheet folded down into a single strip, grab it in the middle, and see how it fans out. You may want to use tape to hold a perfect fan shape. Attach with tape or glue. To make the curled ribbon below, rip or cut it into strips, and then curl each strip with a straight edge, like a ruler or scissor edge. For more inspiration check out Tip 1: Spot the Holiday Symbols and Tip 2: Look for Visually Striking Images plus John Boak’s Wrap Art book. Then have fun and see what ‘WOW” ribbons you can make. This is the third of five green tips Franke is writing for PlanetGreen, the bouncy offspring of Treehugger.com and Discovery Channel. Photos of junk mail gift wrap by Franke James (or as credited); Ads featured in gift wrap were from unsolicited mailings or newspaper inserts.